I'm here to share how scrapbook layout sketches can help to save you time, money and frustration. How many of you have been in this situation? You have an idea for a layout. You start to work on the layout. You end up frustrated because it's not turning out exactly like you had imagined in your head. I know that I have felt this way and if you ask most scrappers they will say the same thing. But, it's also important to remember that rarely will your layout end up exactly like you had imagined because as you create the layout, you may come up with other ideas. Bottom Line: Try not to get frustrated as it can put a real damper on your creativity (and keep reading...for a great way to make layout creation a snap). As I mentioned, I have had my share of frustration in creating layouts and found the best way (for me) to better visualize my ideas is to use scrapbook layout sketches. What is a scrapbook layout sketch? Consider it a rough draft of your scrapbook layout. Think about it... Would an architect construct a building without a blueprint? An author write a novel without a draft? A mechanic make a repair without a schematic? So, why should creating a scrapbook layout be any different? I first create a scrapbook layout sketch based on the idea in my head. Then, to make sure that particular configuartion actually works, I take pre-cut templates, that I made, in the shape of pictures and page elements (e.g., paper strip) and lay them out on a scrap piece of 6x6, 8x8 and 12x12 paper. I forewent spending hundreds of dollars for a pre-made layout design system and used cardstock scraps to make my own templates. Not only does it save money, but it makes scrapbook layout design so much easier. So...don't throw away that unused cardstock! 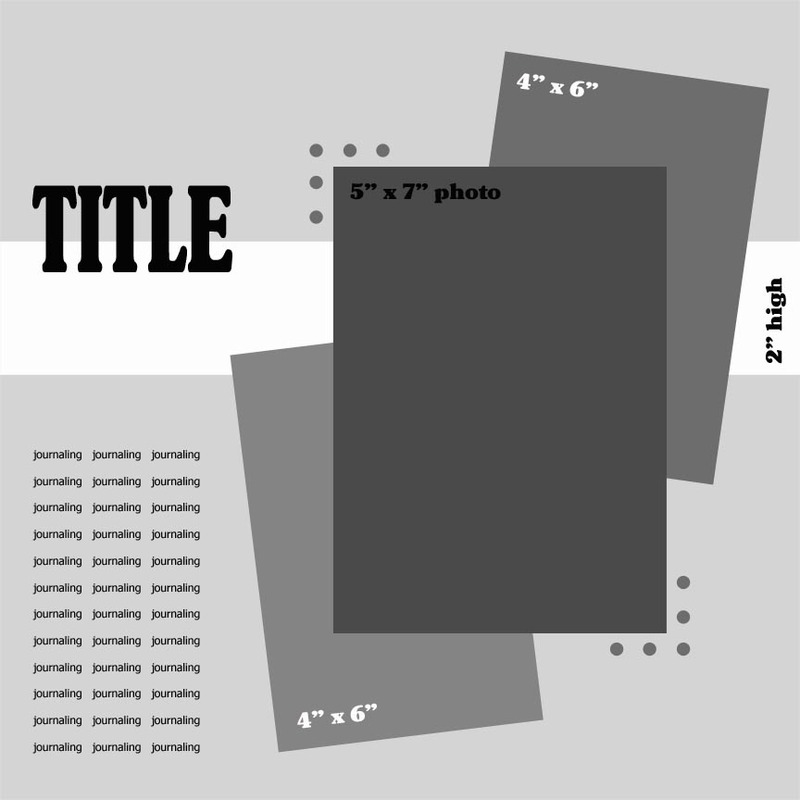 As you create more scrapbook layout sketches, make additional templates as necessary (e.g., tags or different size pictures). It helps you make more efficient use of your time when you actually get around to scrapbooking. If you already know how you want to layout your pictures ahead of time, think of how many pages you could actually get done. It helps you make more efficient use of your supplies. When you use a scrapbook layout sketch as the basis for your page, you reduce the risk of needing to waste your "good" scrapbook paper to visualize an idea. Now, it's best to keep all of your scrapbook layout sketches in one location - no sticky notes allowed! This can be as simple as a spiral notebook or a true sketch pad, but it's critical that you have something in which to record your ideas for future scrapbook layouts. I often feel like mine is attached to my hips as I'm always getting inspired by something new. TIP: You can also use your sketch book to record color ideas. Do you love the colors in one of your son's shirts? Did you see an unusual, but great, color combination on a lamp shade? Why not keep a record of the colors for a potential future layout? It's not difficult to do... Just cut out a few swatches of cardstock for the colors, glue them to a page in your sketch book and make notes, as appropriate (e.g., what theme it could apply to). It seems simple, but you'll be surprised at what you don't remember a few months down the road. The more scrapbook layout sketches you create, the easier it will become for you to visualize a complete layout in your head. If you're looking for some inspiration, check out my FREE scrapbook layout sketches - available at the Choubox Sketch Pad.